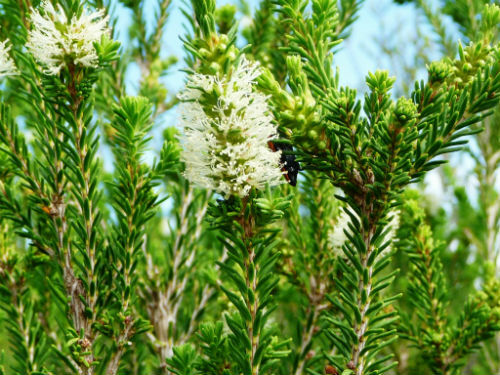 Melaleuca quadrifaria, Limestone Honey-myrtle, is a tall shrub that may reach a height of five metres. This many-branched shrub carries crowded, linear leaves that curve upward. They are five millimetres long and arranged in pairs around the stems. The upward curve, of the leaves, is a distinctive feature. Creamy-white flowers are borne in terminal clusters and appear in spring and summer. They attract a wide range of native insects. Remove the spent flowers to improve foliage density and flowering. The Limestone Honey-myrtle occurs in southern Western Australia and South Australia where the species is found in a small area on the coast near the Western Australian border. M. quadrifaria could be cultivated in hedges and screens. The dense foliage provides safe nesting sites for small native birds. The species name is from the Latin: quadri meaning four and fidus meaning split. This refers to the leaves in four rows.